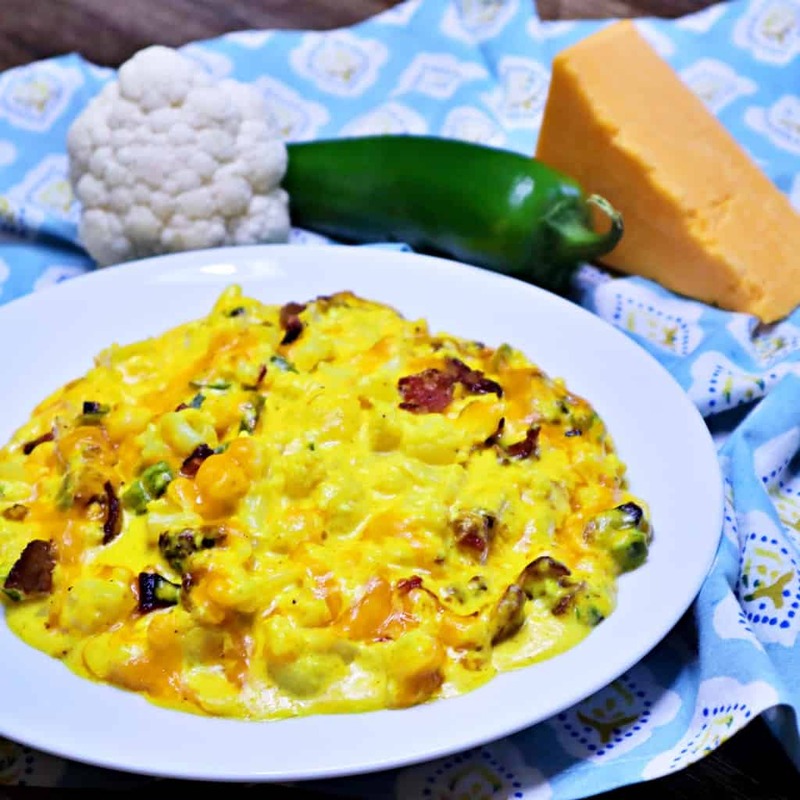 This dish of Keto Cauliflower Mac and Cheese makes a great entree option, and it also makes a fantastic side dish to accompany your choice of meats. This is a very quick and easy recipe to make, and if you feel like cutting some corners on the recipe to save time or be more convenient you can even use “Steam in the Bag” Cauliflower to make this recipe too if you like. We won’t judge you if you don’t feel like making it totally from scratch. 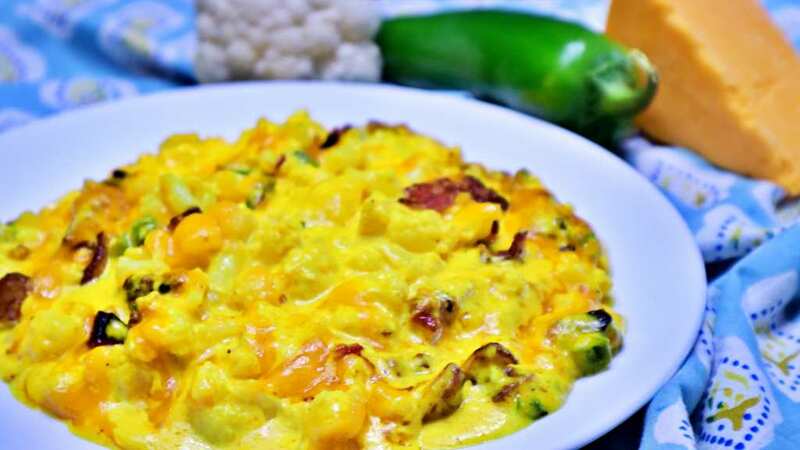 We also think that the Cheddar Cheese Sauce that we make in this Keto Cauliflower Mac and Cheese Recipe could go great mixed in with Broccoli or other steamed vegetables too (Did we hear some of your say Brussels Sprouts?). When we make this for our kids we leave out the Bacon and the Jalapenos on their portion, because my son doesn’t like Spicy foods. Then again, he thinks that Black Pepper is too hot sometimes too. 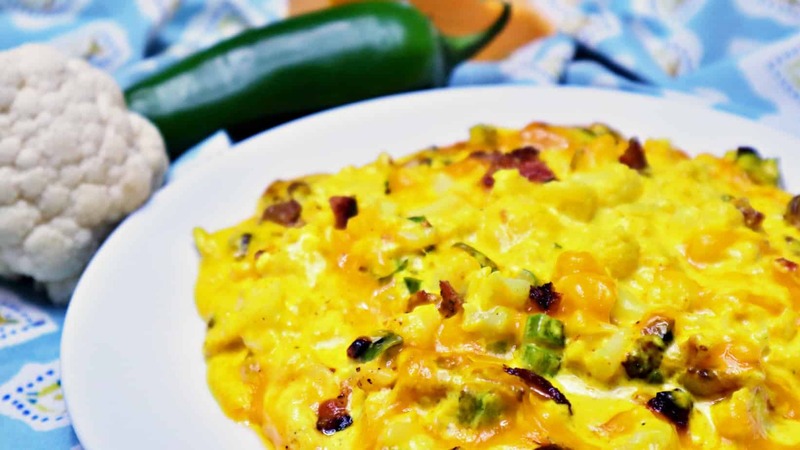 We would love to hear your suggestions or comments down below in the Comments section if you have some more creative ideas for us, or if you would like to share how you make your very own Keto Mac and Cheese too. Heat up a Large Frying Pan over Medium High Heat and add in 6 strips of Uncured Bacon. Cook the Bacon while preparing some of your other ingredients. Break up 1 Medium Head of Cauliflower and chop up just the florets at the top. Do not mince these too finely, because we do not want this to have the consistency of Cauliflower Rice. Instead we want it to be kind of chunky still, like the texture of Macaroni Shells. Cover the Cauliflower with some water in a Microwave Safe Dish with a lid on it and cook on High for about 10 minutes to tenderize. Shred 2 Cups of Cheddar Cheese, and De-seed and Dice your Jalapeno. When the Bacon is fully cooked and crispy, remove it from the Large Frying Pan, but retain the Bacon drippings in the pan. Add the Diced Jalapeno to the Frying Pan and stir quickly to try to coat it evenly in the rendered bacon drippings. Saute and stir for about 3 minutes, until tender and then remove from the pan and set aside. In that same Large Frying Pan add in 1 Cup of Heavy Whipping Cream, and 4 Ounces of softened Cream Cheese. Stir together a couple minutes until well blended. Sprinkle in about 1 Cup of the Shredded Cheddar Cheese, and stir until melted in. Season the Cheese Sauce with 1 Teaspoon Dijon Mustard, 1 Teaspoon Tumeric, 1/2 Teaspoon Granulated Garlic, and Salt and Pepper to taste. Add in the strained and cooked Cauliflower, half of the cooked bacon (diced up), and the Jalapeno. Stir to incorporate the sauce evenly with the ingredients. Top with the remaining Shredded Cheddar Cheese and cover with a lid to simmer for about 5 minutes (or until the cheese on top has melted). Remove from the heat and serve as an Entree or as a Side Dish with another meal. I just made this and, OMG – so good. I wish I could post a picture so that everyone can see just how pretty my plate is. Thanks so much for the receipe.